We started tracking Burton Snowboards on July 19, 2016 and have received 430 from them. Create a Paid account to view all their emails. 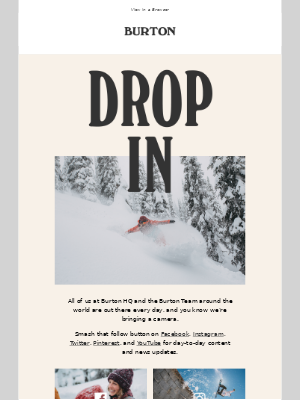 Burton Snowboards sent 17 emails in the last 30 days. MailCharts helps you deeply understand a company’s email program. MailCharts manually signs up for the different user journeys you care about. Use this data to plan your lifecycle campaigns. When was the last time you purchased from your competitors? As a pro user, you can request we do this so you can visualize the email journey for any user journey. 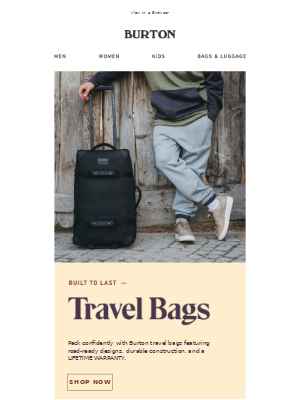 This way, you can see what your competition sends in the first 30 days of emails. MailCharts detects ESPs and technologies used in any email—including advanced analytics, dynamic content, remarketing pixels, and more. Interested in understanding exactly what technology powers a company’s email program? Our Enterprise plan is for you.